With a soft colored candle burning in the background, this Brownie Almond Torte Dessert is served with a scoop of decorated ice cream, a swirl of strawberry coloring and a juicy strawberry. When served at the Tuckamore Lodge in Main Brook, Newfoundland, guests have a hard time saying no to this beautifully presented dessert. Brownie Almond Torte served with Icecream, Tuckamore Lodge, Main Brook, Viking Trail, Trails to the Vikings, Great Northern Peninsula, Northern Peninsula, Newfoundland, Newfoundland Labrador, Canada. 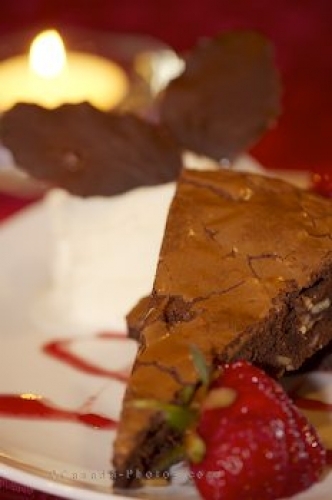 Picture of the elegant way a Brownie Almond Torte should be served for dessert.